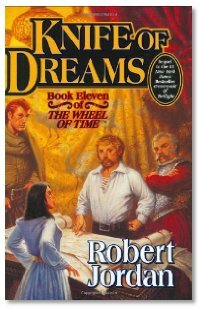 Knife Of Dreams by Robert Jordan. The Ancient One by Sheri L. McGathy. This week we have the one and only Robert Jordan on the show. Talking about his long awaited book Knife Of Dreams. It is the 11th in the Wheel Of Time series, and we hear that the next book will be the last. (In this series anyway.) If your a fan, this is a 'don't-miss' episode. Next up Sheri L. McGathy is telling us about The Ancent One. This E/Audio book is about gods and how they came to be. Michael and Joe handle this week's Library Segment. Tune in and find out what is new in the studio this week. Michael feeds 'Women Battling Over Soup' to the dragon this week. Hey Evo, Michael, Summer...thanks...I'm thrilled. In the Library segment Joe talked about Susan Palwick's _The Necessary Beggar_, mentioning she'd previously written _The Lovely Bones_. So which is the pseudonym -- Susan Palwick or Alice Sebold?